I custom built a powerful multimedia PC for my personal use. This entire site was developed using my PC. Slot 1 Pentium II 333 Mhz CPU with 512k Cache. 128MB SDRAM. (Three 168-pin Dimm Slots for up to 384MB). Universal Serial Bus (USB) connectors. 2 Bus-Mastering PCI EIDE Ultra DMA/33 controllers (Up to 4 devices). 4 PCI slots, 2 ISA Slots, 1 PCI/ISA is shared. National PC97307 Super I/O controller. (2.88MB Floppy Port (controls 2 devices), 2 Serial Ports, EPP/ECP bi-directional parallel port, IrDA infrared interface, etc..). Phoenix Flash BIOS with full Plug and Play support. Flash EPROM for downloadable BIOS upgrades. Intel Smart Video Recorder III. 32-bit PCI card, full PnP support. Supports NTSC, PAL, SECAM, composite, and S-Video inputs. Creative Labs Sound Blaster 32 PnP. E-mu Systems® EMU8000 sound and effects generator. 16 channel, 16 voice multi-timbral capability and 32-voice polyphony. 128 instruments, 10 drum kits. Creative 3D Stereo Enhancement Technology. 8-bit and 16-bit selectable mono and stereo sampling and playback. Sample and playback rates from 5 kHz to 44.1 kHz. 20-note, 4 operator, stereo music synthesizer. Music synthesis can be enhanced with reverb & chorus. 1MB ROM of sound samples. 2MB DRAM installed in the 2 30-pin SIMM sockets provided for user upgrade. Balance, bass and treble control. IBM® compatible 15-pin joystick port (doubles as a MIDI port). Full Plug and Play Support. Full PnP support for up to 7 SCSI devices. Termination is single-ended, active, and automatic. Hewlett Packard SureStore CD-Writer 4020i. 600 kBytes/sec (Quad speed) reading. 300 kBytes/sec (Double speed) recording. 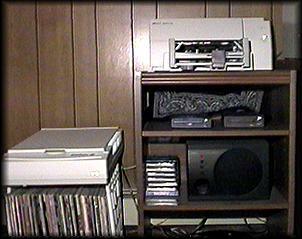 Reads/Records data and audio CD's. 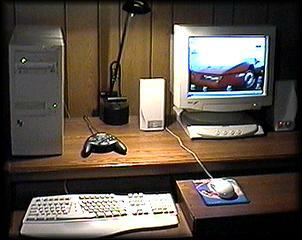 Creative Labs PC-DVD x2 Drive. 8.4GB, 9.5ms access time, Ultra DMA Mode 2 33.3MB/s, 256K cache, 5400rpm. 4.3GB, 11ms access time, Ultra DMA Mode 2 33.3MB/s, 256K cache, 5400rpm. 1.6GB, Sub 10ms access time, PIO Mode 4 16.6 MB/s, 128K cache, 5200rpm. Teac 1.44 MB 3.5 inch floppy. US Robotics Sportster 56K Data/Fax Modem. 8 Bay ATX Mid Tower with a 250 watt power supply. Optional Photo Color Kit for printing Photo-quality pictures in 6 colors. Up to 5 ppm in black and 1.7 ppm in color. 600x600 dpi in black, 600x300 dpi in color. HP RealLife Imaging System with Resolution Enhancement technology (REt) and HP ColorSmart. IEEE 1284 Bi-Di parallel interface. 512Kb built in RAM, 32 Kb receive buffer. 24-bit color, single-pass flatbed scanner. Linear array CCD with daylight fluorescent lamp. 300x600 dpi optical resolution, 2400x2400 dpi interpolated resolution. 17 ", dark tinted, flat square tube. One-step zoom and scroll with the Wheel (In between the 2 mouse buttons). Eight way direction pad, Six gaming buttons, and two trigger buttons. Game port allows daisy chaining of game pad. Game device profiler maps multibutton moves or keystroke combinations to a single button. Yamaha YST-M10 powered monitor speakers and YST-MSW10 Subwoofer System. 10W per channel, Active Servo Technology. Full-range 3.5 inch magnetically shielded drive unit. 80Hz ~ 20kHz (+-)3dB Frequency Response. 25W mono, Active Servo Technology. 6.3 inch cone woofer, magnetic shielding. 35 to 250Hz (-10dB) Frequency Response. Features High/Low cut filter, volume control, and auto power on/off. Up to 60MB per minute transfer rate. External EPP parallel port drive. Tray loaded drive uses 3GB, 5GB, and 7GB tapes. Flash!File technology accesses files in a 125MB area in an average of five seconds from a loaded tape. Average backup time: 19MB per minute. 2.0 Mb/sec to 4.0Mb/sec Data transfer rate. APC (American Power Conversion) personal power manager. 4 switched outlets, 1 unswitched outlet.